After Bhagawan's Mahasamadhi, on November 23rd, 2011, i.e. 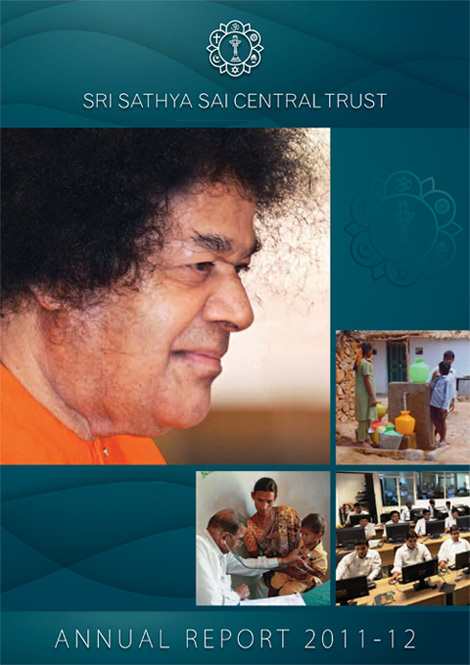 on Baba's 86th birthday, the Sri Sathya Sai Central Trust released its very first Annual Report. Again on November 23, 2012, on the occasion of the 87th birthday, the Trust released its second Annual Report for the year 2011-2012. Mrs. Karuna (KSM): Sai Ram Prof. Anantharaman and welcome to Morning Glory. Prof. Anantharaman (Prof. AR): Thank you. KSM: Sir, congratulations to your team for a very well laid-out annual report. The contents and the design are very inviting and it's actually quite engaging to read. It offers so much more than just dry statistics. 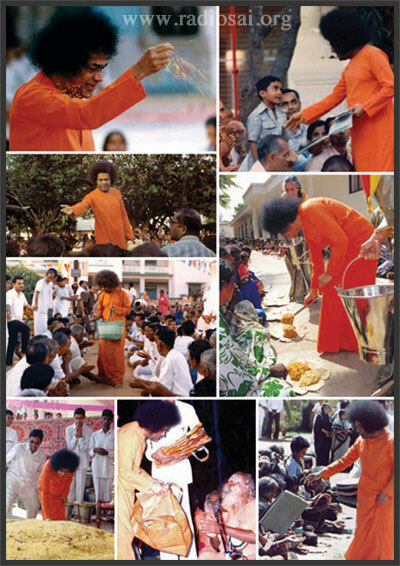 And since Radio Sai listeners are people across India and around the globe who are deeply committed to Bhagawan and His mission and not all of them have a copy of the Central Trust Annual Report to read, we are hoping that today, on Morning Glory, you will offer them an executive summary of the main points of this report. So how did this trend of having an annual report begin? Prof. AR: If you recollect, after the Mahasamadhi, there was some extensive reporting in the press about several alleged happenings in Prasanthi Nilayam. There was a lot of negative reporting; there were questions; there were innuendos. That was the time it was felt maybe some of these need to be countered – we need to explain to them what exactly was happening. During that period, it was also decided that we should release an Annual Report that summarises all the activities of the Trust in order to tell people what exactly is happening to put everything in the proper perspective. So, in 2011, we released the first Annual Report and in 2012, we have released the second one, which is an improvement over the first. Hopefully, in future years, this will continue to be released and every year, we will look at it differently and improve upon it as we go along. That's the basic genesis of why the Annual Report was issued from 2011 onwards. KSM: Did you have a model to work on? How did this whole idea start? Prof. AR: Not really. In fact, it was basically started as a report which will just indicate our activities. We subsequently looked at several Trust reports issued; almost about 40-50 different Trust reports – from the Bill & Melinda Gates Foundation, from Dadabhai Naoroji Foundation; we looked at company balance sheets, etc., etc. From all these, we formed a broad idea of the method of presentation – what other people are talking about. But with respect to our own report, our objective was four-fold. Firstly, we wanted to cover in a print format the extensive welfare activities of the Sai organisation, not necessarily about the Trust. We wanted to talk about the entire Sai movement and we wanted to divide all of them into several different sectors. Rather than talk about what organisation A or organisation B did, we wanted to divide them all into activities like Educare, Medicare, Sociocare. We also felt that we need to give them statistical information – how many students are studying in the colleges, how many surgeries are being done, etc. So, it's a combination of activities, records, statistics and also objectives. We also, through all this, wanted to convey a message that all activities of Bhagawan continue exactly as before, there is total stability and we are well on the way to fulfilling Bhagawan's mission fully. These were the four objectives. So, we used, I must say, the Annual Report as a vehicle to convey all these in a meaningful manner. KSM: So, this attempt at transparency and accurate information dissemination – who was it intended at? Prof. AR: Predominantly, this was intended for opinion-makers, press, people in the government, bank and our donors, our contributors. But in the very first Annual Report, we felt we also have to communicate to our own fellow devotees – a lot of them were feeling confused as to what was happening. So, even though the predominant audience was the opinion-makers, the donors, bankers, the government people, etc., our large body of devotees also were part of this, even though they were not the main people intendees as far as this message was concerned. Overall, it communicated a necessary message to all the people concerned. KSM: For the past two years, on Bhagawan's birthday, the Trust has been holding a media conference after it releases the report. So, how has the response from the media been to the Annual Report? Prof. AR: Oh, the response of the media for the Annual Report this year has been outstanding. Last year, it was kind of lukewarm because we did it for the first year. KSM: I think some statistics that they were looking for were not in last year's Annual Report. Prof. AR: Exactly. Last year, for example, we didn't give the full financials. It was just an attempt; we put something together. KSM: It was a great start, though. Prof. AR: Right. This year, the press conference was outstanding. The purpose of the press conference was to give them copies of the Annual Report and also take any questions about any matter connected with the Trust that they wanted to raise. In fact, the reaction was extremely enthusiastic because there were banner headlines and one of the vernacular newspapers said, “Sathya Sai Trust clearly establishes transparency.” This was the banner headline in one of the papers. KSM: It's a real pat on the back of Central Trust. It basically talks about a record of all our activities here. We have released the full financial information here – how much was received, how much was spent, and the same papers that were reporting earlier that there were secret tunnels here and all that were the same papers who came back and said something which was absolutely frank – “We've not seen this kind of a report from any other charitable organisation” and it was very very laudatory. KSM: That is very pleasing to hear! KSM: Is it going to be an annual affair now, although you're not mandated by the law to do so? Prof. AR: We're not mandated by the law to do that, but as we prepare this, we ourselves are struck by what is happening here. Each year as my colleagues and I prepare this annual report, we are wonderstruck at both the extent and the depth of this whole organisation. Prof. AR: We have all kinds of people here. We have cardiologists working as photographers, chief engineers doing electrical work, research scientists working as carpenters – all kinds of people, groups of people that are working here. As we write it, we ourselves are completely taken aback at the vastness of this movement. So, in addition to conveying a message to outsiders, this also seems to be an opportunity for all of us to record and turn inwards, look at what is happening and make corrections. For example, arising out of this now, I understand every state organisation has been asked to produce a report by the All-India President; the International organisation is going to produce its own report. So, it's also consolidating our own thinking and recording. The moment you have to put something in writing, there's a greater efficiency happening and we see it driving an efficiency right through the organisation. I think that is one of the biggest advantages of this Annual Report. KSM: So, that's very forward thinking on part of the Central Trust and the Sai Organisation to think in these terms. Now, what are the main topics? 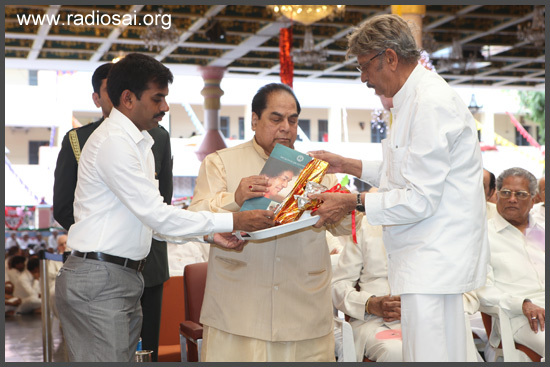 I understand from browsing through the Annual Report that you have covered the activities of the Central Trust, the Sri Sathya Sai Seva Organisation of India, the various Trusts that function in the Ashram such as the Media Foundation as well as the International Sai Organisation. So, what all lies between the covers of this report? Prof. AR: Well, the best way for me to do that would be to go over the report. We start with some introduction. For instance, we start right on the first page with a letter Swami wrote in May 1947 when He was 20 years old, where He basically for the first time declared, “No one can comprehend My Glory, whoever he is, whatever method of inquiry and however long his attempt.” We have reproduced that letter. KSM: And it rings so true! Prof. AR: Absolutely! If one goes through the complete report, it's almost as if what Swami talks in these lines are reflected in the rest of the pages – as if it's a confirmation of that. KSM: It's a 120-page report and after going through it, you realise nobody can comprehend the enormity or the profundity of this mission. Prof. AR: Nor the vastness nor the diversity. They are also additional things. We start with the report of the trustees, which is a very conventional report, and then we talk about how our Trust is organised. Ours is a very complex organisation. We have half a dozen different Trusts; not all of them have an official, legal, administrative reporting relationship to each other, but all of them have a common objective of Swami's mission. We tried putting together a graph, an organisational chart, indicating how all these organisations go together, etc. ; so, that was an attempt. In the page after that, we have a financial statement. 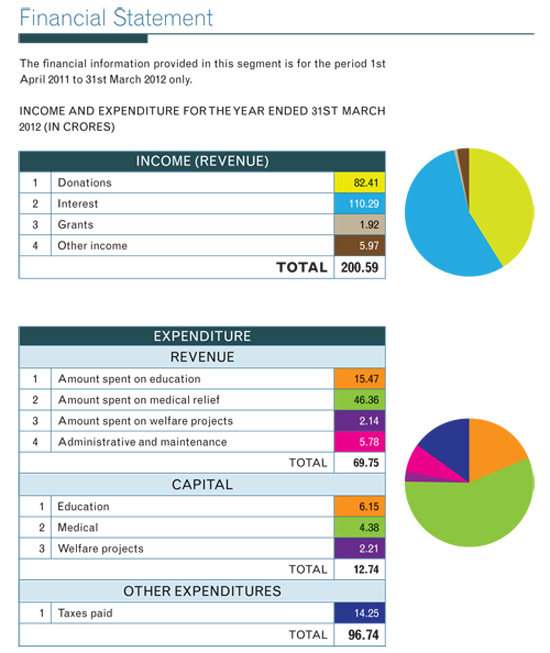 For the first time, we are giving a financial statement of income, expenditure, and where the sources of funds came from. Where the funds were applied – how much on education, how much on medical relief, how much on welfare activities, how much on medical, and in order to make it easily understandable to people, we have often given a pie diagram, block diagram. KSM: Such colourful infographics and so easy to understand and grasp! KSM: Before you go any further, this is one topic that was really hot or making headline news in the canard that we experienced after Bhagawan's Mahasamadhi. There were all kinds of unimaginable amounts of monies that were being mentioned about the assets of the Trust. So, based on the Annual Report, would you like to tell Radio Sai listeners what sort of an income we had last year in crores? Prof. AR: Last year, if you see the income and expenditure statement, we had two sources of income. One was from donations from people. Another was interest from capital funds, which we already have, and a small amount of grants. Putting them all together, there was a total receipt of about Rs. 200 crores, out of which Rs. 82 crores came out of donation, Rs. 110 crores came from interest in capital fund that is already kept with us. KSM: Swami was so futuristic. He invested enough money to ensure the longevity and continuity of His dynamic institutions. KSM: Just the interest is Rs. 110 crores. Prof. AR: Interest alone is Rs. 110 crores; it is absolutely adequate to keep all our activities at the current level without any problem whatsoever for at least another 5 years. KSM: Wow! That is so heart-warming to know. Prof. AR: Yes. The only thing is for future projects and to provide for inflation, etc., we need to continue to get donations. After all, we need to undertake greater activities, more activities, etc. So, donations need to continue to come in and all these donations invariably would be put either as capital fund or as projects. KSM: And even last year, we had over Rs. 82 crores. Prof. AR: Over Rs. 82 crores was the amount that was received as donations. So, the story that donations have dropped, funds have dropped, there is financial crisis is completely incorrect information. KSM: It is not based on truth at all? Prof. AR: Absolutely not! People continue to be very conscious of the fact that donations need to be made for all these welfare activities. There's been no reduction in these of any whatsoever. In fact, all activities, all expenditure of the Trust, all future projects, etc., are going without any diminution whatsoever. KSM: It's very interesting – people who contribute their resources, time and energy and love to Bhagawan's mission are never influenced by what the media says – that has been a very common thread throughout the Sai Avatar's career – but those who have nothing to contribute except maybe some sound bites are the ones who read this stuff and get so influenced. KSM: How did we do in terms of sources of funds? Here, you've spoken of capital funds and current liabilities. Would you like to explain what that's all about? Prof. AR: Sources of funds are the funds that we have received over the years, which are kept as a general fund; interest out of that is an income and we spend that interest towards these welfare activities. 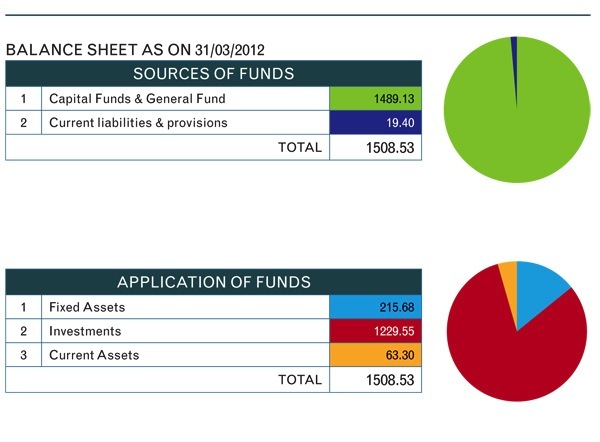 KSM: And we have a lot of fixed assets, investments, current assets – those are application of funds? These are huge amounts of money. Prof. AR: Not really. If you look at the fixed assets, you will find in the application of funds, out of the Rs. 1,508 crores of sources of funds, Rs. 1,229 crores are invested in deposits, etc., out of which you get an interest of Rs. 110 crores. KSM: I see! Out of curiosity, what sort of investment strategy does the Trust use? Prof. AR: We don't really go for investment into stocks. Swami was very very careful while He was here. All our investment is invariably in bank fixed deposits. Prof. AR: Nationalised bank fixed deposits. And Swami was very particular that we should take no risk with these capital funds. We must ensure that we get the maximum amount of return in gilt-edged securities. As far as these are concerned, we are still following exactly the same kind of a thing. KSM: Wonderful to know that! I'm sure listeners will appreciate it very much. Prof. AR: One more significant thing to note is, as we have also mentioned in the report, out of a total expenditure of Rs. 82.49 crores, Rs. 76.71 crores, that is, almost 93 percent, has been spent in service and welfare activities. KSM: Wow! That is one impressive ratio for an NGO! Prof. AR: Only 7 percent has gone towards miscellaneous, administration, etc. It's a very clear indication; it's okay to spend the money but it's very gratifying to know that over 93 percent of this money has been spent on real welfare activities. Prof. AR: So, there have been no secret tunnels or siphoning happening anywhere. KSM: (Laughing) I'm sure Radio Sai listeners were never concerned about the secret tunnels, but it's good for the media to know the truth as it stands. Prof. AR: On subsequent pages, we give a complete report about compliance and social impact. There were some comments last year about, 'Where is this money coming from? ', 'How much foreign donations? ', etc. We make a complete statement about the Ministry of Home Affairs; we need to give a return on Foreign Contribution Regulation Act; we need to give returns under the Income Tax Act. All these returns have been submitted on time and we are giving a statement of what returns were submitted to them at what time; it's a complete statement. 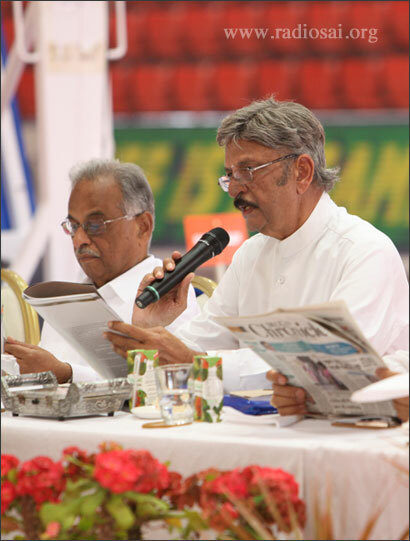 KSM: Considering the calibre of the Trustees of the Sri Sathya Sai Central Trust, this is not surprising at all because everything we have done has met the highest possible standards of accountability and transparency. As far as compliance and social impact go, I think this is one model Trust in India, with the Annual Report becoming an annual feature, that people will look up to for transparency and accountability. Prof. AR: Absolutely! Even then, we re-examined our internal audit systems, we re-examined statutory reports, went through the whole thing with a fine tooth-comb and ensured that internally, we have created enough safeguard and protection to ensure that there is a complete rigorous control system being followed. This is because the Trustees are constantly conscious of the fact that they are all just Trustees of a wealth that is handed over to them and they need to maintain it and spend it and spend whatever proceeds they have out of it for public good; they are extremely conscious of that. KSM: All of them work in honorary capacities. Prof. AR: They travel at their own expenditure and give their time freely and willingly. KSM: And professionally, they are all highly qualified for this sort of work. Would you actually like to tell our listeners who exactly the Trustees are? When I was watching the news media, it was very interesting; they were naming people who are not even on the Trust. Prof. AR: Justice Bhagawati, a former Chief Justice of India, and then Sri Indulal Shah. Sri Indulal Shah, as you are aware, has been a doyen of the Sai movement in India, responsible for creating the All-India Organisation and International Organisation, a long-time associate of Swami. KSM: A chartered accountant by profession. Prof. AR: Leading chartered accountant by profession. Sri Giri, who was also the Vice-Chancellor (Bhagawan's University); before that, he was the Chief Vigilance Commissioner of the Govt. of India; he was the Secretary to Govt. of India, Department of Education; Sri V Srinivasan, who was formerly the National President of the Confederation of Indian Industry (CII), currently the President of the All-India Seva Organisation; Sri Chakravarthi who was the Collector, District Magistrate and Former Finance Secretary (Projects), Government of Andhra Pradesh; he was also the former Commissioner of Commercial Taxes, Govt. of Andhra Pradesh; Sri Bhagavat, who was the former Chairman of Indian Overseas Bank; Sri Shetty who was the former Chairman and M. D. of Canara Bank; Sri Naganand, Supreme Court advocate and a chartered accountant; he is also the President of the Karnataka Section of the International Commission of Jurists; and Sri Ratnakar, who is an MBA from the Sathya Sai Institute of Higher Learning and also an eminent and active social worker and a leading citizen of Prasanthi Nilayam. KSM: That's a very impressive list indeed! I'm sure our listeners needed to hear that because some of the media reports were hilariously inaccurate. Considering that Mr. V Srinivasan is an entrepreneur himself and he's the All-India President of the Sri Sathya Sai Seva Organisation, they kept mixing his name with a number of other persons with the same last name. They didn't even do their homework to find out which Mr. Srinivasan was on the Central Trust.